Oh Dog! I am so very excited! Today I have a special guest. Mr. Bear is one of my bestest Twitter friends. He is quite the Bear About Town, and you’re going to love his story. So please put your paws together and help me welcome my first ever bear guest! Rumpy: Thanks for being my guest today! Tell the readers a little bit about you. Mr. Bear: I am a BIG bear. I am 3 feet 3 inches tall. My head and tummy are both 38 inches around and I weigh over 300 pounds (although my human says the scale is wrong). I wear male human size large clothes. My favorite foods are salmon and honey and I always have my paw in a pot of honey. Rumpy: Yummy! I am envious! Mr. Bear: I also have my own sofa, my own armchair and a hammock I sleep in at night. I spend my days napping, eating and supervising my humans. I also like to drive around at night and go on adventures while the humans are asleep. I am a billionaire bear because I collect royalties anytime a bear is featured on TV in a movie or in print. 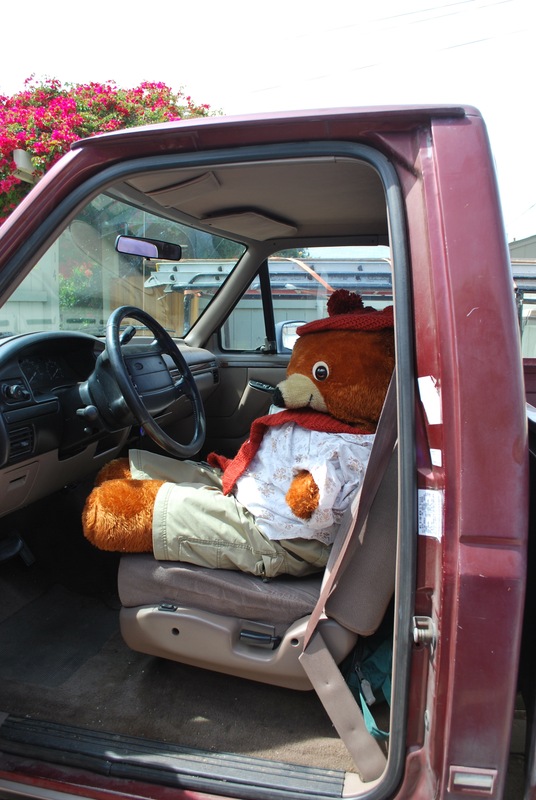 I also own my own line of car wash businesses, called Brown Bear Car Wash. Of course, the bears don’t actually wash the cars, they supervise the humans washing the cars. Rumpy: Oh my Dog! I had no idea you were such a rich bear! Tell me about your family. Mr. Bear: My best friend is Rocky. He is a beary small bear so he likes to sit on my lap or on my head. There are lots of other furry friends who live with me including a penguin named Petruccio and Rocky’s cousin Grey and many many more. There is a cat named KDL (Kitty on the Down Low) who likes to try and steal attention from me. Oh and there are two humans who occupy my house as well. The female one is Minion and the male one is Doofus. Minion is the better servant to me as she feeds me and carries me around (I don’t like to walk and get my paws dirty). However, Doofus is much cooler since he likes to eat fast food and play video games. Both humans require a lot of supervision as they are not as smart as me and have much smaller brains. Rumpy: Those humans can be alot of work, can’t they? Where do you live Mr. Bear? 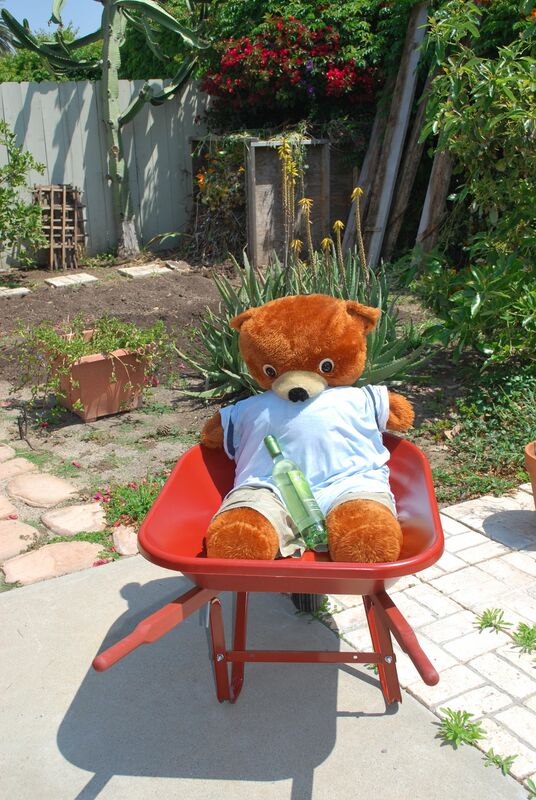 Mr. Bear: I live in Southern California. I love it here because the weather is almost always nice. I live about ten minutes from the beach but I don’t go too often because I don’t like to get sand in my fur. Rocky likes the beach a lot more than I do. He and his cousin Grey go together and drink mocktails with little umbrellas in them. I have a pretty big yard where I have lots of fruit trees including tangerine, lemon, avocado, guavas and mulberries. I live in a climate that would be very conducive to having my own swimming pool but I don’t have one yet. I am beary sad that I don’t have my own #bearpool. I am refusing to take a bath until I get one! As you can see, I am a bear of high principles. Rumpy: Indeed! I guess your standards are high for treats as well? 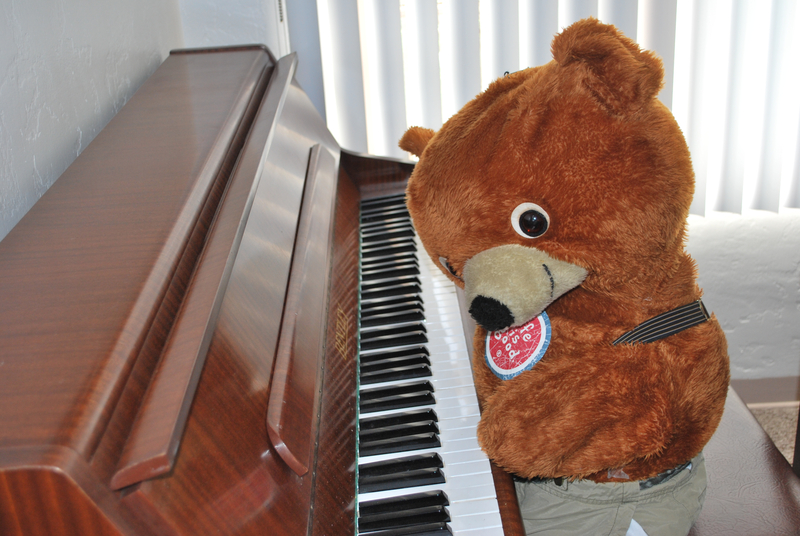 Mr Bear is a piano virtuoso! Mr. Bear: As I mentioned, my favorite foods are salmon and honey. However, I like lots of other foods too. My favorite desserts are honey pies and I also like honey cakes and honey cookies as well. Mr. Bear: I eat salmon pizza a lot and tuna sandwiches at least once a week. Sometimes I eat cheese and chocolate too. However, I hate veggies and anything green and also grains. Minion is a vegetarian and she tries to torture me by feeding me veggies and quinoa (a grain) and it makes me beary angry. That’s why Doofus is cooler; he eats mostly meat and cheese. Rumpy: Sounds like it! Now what social media do you use? 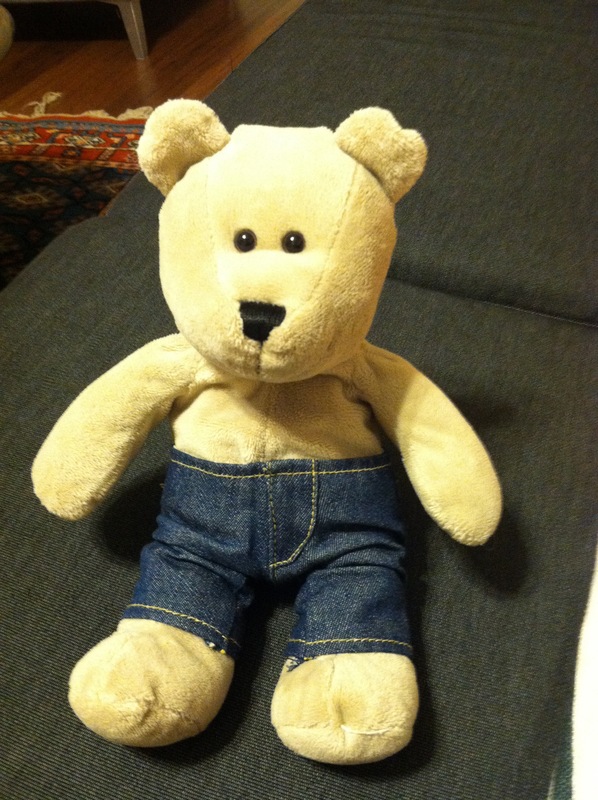 Mr. Bear: I am a twittering bear. Twitter is my favorite social media platform. I used to be on Facebook but they deleted me because I was a bear. I am filing a lawsuit against them for discrimination against bears. I also have a blog but I haven’t updated it in years because my minion is beary lazy. I don’t use any online dating site because I plan to be a bearchelor for life! Rumpy: Me too… *whispers* I’m neutered! *clears throat* Now one last question for fun. If you was a dinosaur, what kind would you be? Mr. Bear: If I was a dinosaur, I would be a bear-dinosaur because bears are BEST, no offense. I would be a really big dinosaur since I am a big bear in real life. I would eat lots of fish (especially if they had salmon back then). I would also be able to fly because I think that would be cool. Rumpy: I think so too! Thanks again for being my guest today! woo woo woo! Mr. Bear: Thank you beary much for interviewing me. 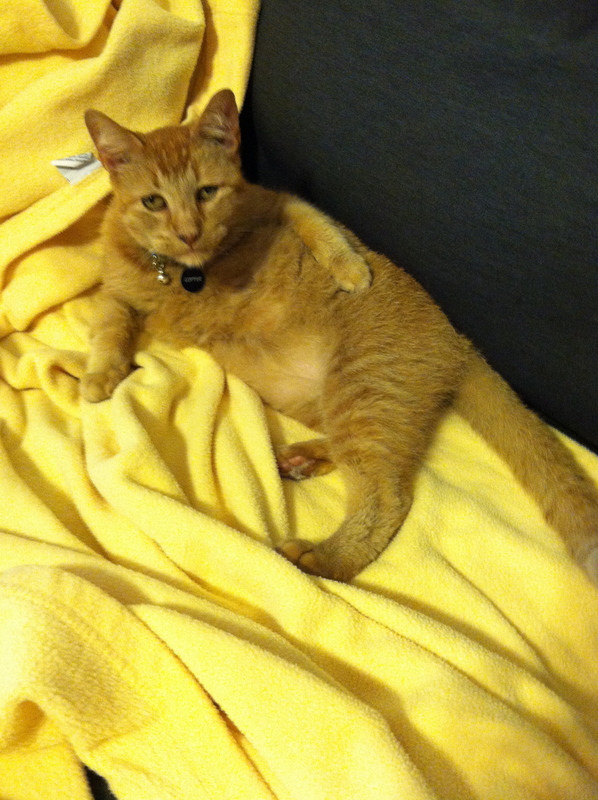 And please vote for Yours Truly in the World Spay Day Pet Pageant! And please share with others! Thanks so much for your support! « I’m the King of the World!!!! It was lovely to meet Mr Bear. I’ll say ‘hi’ on Twitter. Please do! He’s an awesome bear! WOW – Hi Mr. Bear. Nice to meet you. You sure are a big guy. Rumpy – great interview pal.. He is indeed! woo woo woo! I think Minion and Doofus are the bestest names ever! I know! Aren’t they though? TY Rumpy for interviewing Mr Bear and ty Mr Bear for telling us all about yourself *whispers* I love salmon too! I think salmon is the best! He’s got it all…. looks, brains, AND humor! yeah bear-dinosaurs are the best … I like salmon and honey too – so I’m a bear – great! you need to follow him on Twitter Kevin! Mr. Bear is quite photogenic! 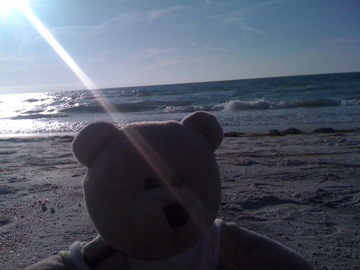 Mr. Bear is definitely living the life! Too bad Minion tries to get him to eat veggies! YUCK! Great interview! I agree…… just say no to veggies! Well, except carrots… and asparagus….. and green beans…. and…. how about salmon AND honey…. cookies! Oh my…I will have to think about that for a bit! Just do so veryyyyy carefully! Don’t upset the bear! He sounds like a pretty cool bear. Love his kitty friend’s name – KDL. Looks like a munchkin low rider kitty. Cute! He looks too much like June Buggie for my taste! I am a long-time bear fan and it was great to meet one with such an interesting back story Rumpy! Great interview. This bear is the coolest! Yeah, probably not a good idea! Doncha love how he “beared” his soul to me? ROFL… Oh I kill me! Are you a Bear Dinosaur? RAWRRRR!!!! Yes Mr Bear is cool. He sent me a beary nice kissmus card! Nice interviewing technique too Rumpy. Thanks, Rumpydog for opening my eyes to new things, including salmon, and introducing me to your Minion. Thanks for reading Puppy Love on Cookingwithdee.net. Tweet away! Hello Mr Bear…. is there any room for me on a Picnic ? I love Mr Bear I wish he would ressurect his blog it was so nice reading your interview and I learned even more about Bear I did know about his minion but didn’t know Doofus was his male hoomin! This is the first time I have read your blog Rumpy but will follow it from now on! Hello Rumpy I have never seen your blog before but do know Mr Bear well he is always beary entertaining I wish he would ressurect his bloggy but I fort your interview was fapawulous and I has followed your blog! Mr Bear is a werry clever bear and I learned some stuff about him what I didn’t know I fink woo is a werry good interviewer! It’s BJ. I luv bears. Your is so cute. What a beary Good Interview yous did Rumpy! Mr Bear is Beary Funny and Beary Astute! Mr Bear has a very exciting life. We agree salmon is one great food too! But, we’ll save our honey for Mr Bear.